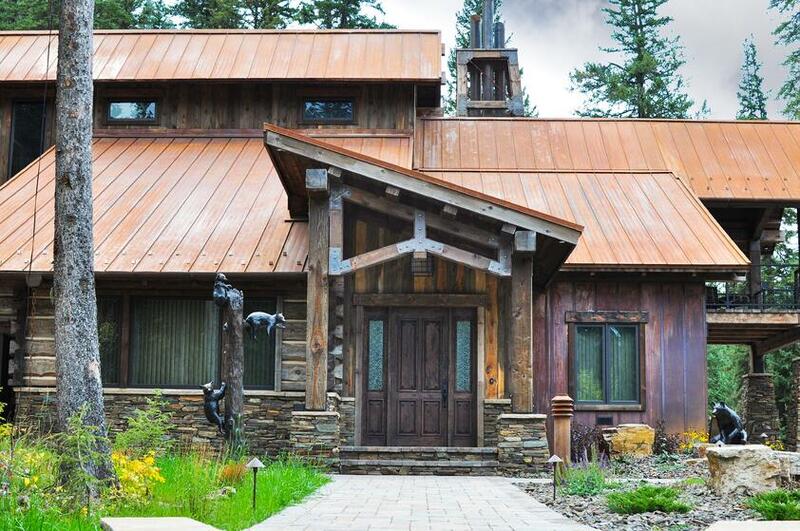 Over the years traditional log cabin designs have transformed to reflect more modern styles. Instead of round logs for siding, modern log homes feature squared logs with carefully hewn corner notching on the exterior. Designers are also using metal siding to break up long spans of logs around entryways and windows. For eye-catching accents, designers and homeowners are using flat panels to contrast the rough texture of wood logs. Flat surface looks can be achieved through custom flat panels or through our V Wall Systems. We offer a V Wall System that emulates and replaces a traditionally wooden interior paneling look with a variety of color options. Custom flat panels are often used with metal strips to showcase entryways or large picture windows. Corrugated panels offer a durable alternative to traditional siding. Cabins tucked in the woods or on the lakeside are exposed to some of the harshest climates. To keep these homes protected, builders are using full corrugated siding or corrugated siding accents. The ribs on these panels create different textures to attract the eye. We have four corrugated siding options. The largest is our 7/8" Structural Corrugated, a heavy-duty 22 gauge siding panel. For subtle corrugated profiles, we offer a 1/2" and 1/4" Corrugated panel that give the corrugated look, but with a more flexible range of paired materials like wood and stone compared to some of our bolder sidings. The right option for a metal wainscoting should take into consideration what material or surface it needs to complement or contrast. Often with corrugated wainscoting, the decision comes down to choosing between a bright finish like a Galvanized or Galvalume, and a darker finish like Vintage or Bonderized. For rustic looks, a rusted corrugated wainscot is also a popular choice. Metal wainscot can also protect against buildup of snow along the exterior of homes. Bridger Steel offers all its colors and finishes in custom-cut and designed flat panels. These panels work great as both exterior siding & wall options.